Mother's day is just round the corner. It's time to pick up some baking skills and impress your beloved mum with your bakes! New dates have been scheduled for Perfect Pound Workshops and Magnificent Muffins Workshops. In our Perfect Pound workshop, you'll be learning how to make that perfect pound cake in two varieties. You'll also bring back the pound cakes that you have baked in class. Check out the details here. 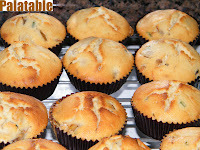 For Magnificent Muffins workshop, it's back to basics. Make muffins without the hassles of mixers. You get to bake three different types of muffins, and bring them home to share with your loved ones! Check out the details here. Hurry, register now as vacancies are limited! Thank you. All the best in your assignment.